Where have you been for 2 weeks? We hope you had a Happy Thanksgiving with your families and didn’t miss us and the Miami RedHawks too much. You guys should have been asking “where are you guys” because we’ve been MIA for a bit. We’re sorry for leaving you hanging, and we’re back at it this week as Miami is already en route to Alaska for a 2 game set in The Last Frontier. For now, here’s what you’ve (we’ve?) missed in the last 2 weeks. First of all, and most importantly, Miami took 5 more points against the Spartans way back on the 16th and 17th of November. On Friday night, Miami held a 2-0 lead and let MSU tie the game before taking the shootout. It was Miami’s 2nd shootout win in a row and 3rd of the season (Providence, NMU, MSU). In the three shootouts, Miami still has not allowed even one goal, as Ryan McKay has stopped the 2 shots he has seen and Jay Williams has stopped all 4 shootout attempts in his 2 wins. John Doherty played in his first game for Miami, Alex Wideman scored to continue his point streak and Alex Gacek scored his 2nd of the year. In Saturday’s game, Miami again went up 2-0, but this time played some outstanding defense and Williams posted the shutout. Miami held MSU to 13 shots on the night, with 9 of them coming from 2 players. Freshman Taylor Richart recorded his first career point as he helped Wideman continue his blazing hot scoring streak in the third period. McKenzie recorded his 3rd goal of the season and Jay Williams got his first career shutout. Even though Miami didn’t play this past weekend, the top of the CCHA standings is still in the hands of the RedHawks at 16 points. Notre Dame had a weekend series against North Dakota (and split). For now, Miami holds a 1 point lead on the Irish, Ferris State and Ohio State. Alaska is just 2 points behind at 14 and Lake Superior State is in 6th at 12 points. The next 3 weekends have Miami playing three of those teams (at Alaska, Lake State, at Ohio State), so to say they will be an important 3 weeks is an understatement. Alex Wideman missed three weeks of play with mono, and since his return has been lights out. He now has 4 goals and 3 assists on the season – good enough for 3rd best on the team. He has also scored the shootout clinching goals in each of Miami’s 2 CCHA shootout wins and is looking better and better on the ice every night out. After the MSU weekend, Miami dropped a spot from #4 to #5 in the polls. We’ll reserve judgement, but Really, that’s stooooopid. The voters made up for their poor choices last week to bump Miami up 1 spot in this week’s (November 26th) polls, but Denver, who lost AT HOME to Yale and New Hampshire, dropped just 3 spots to #5 behind the Hawks. The PairWise is the important ranking, and we’re still a few weeks away from knowing where Miami really stands compared to the rest of the NCAA. In addition, Miami’s All-1990’s CCHA team was announced. In the decade where Miami earned its first ever CCHA Championship in the 1992-93 season and gained momentum throughout, this team looks fantastic. Some guys named Kevyn Adams, Brian Savage, Enrico Blasi, Dan Boyle, Bobby Marshall and Mark Michaud made the first team. The second team has forwards Chris Bergeron, Randy Robitaille and Ken House, defensemen Joe Cook and Steve Wilson and goaltender Richard Shulmistra. The only thing I’d change is putting Shulmistra on the first team and Michaud on the second. You can vote for the all-2000s team on muredhawks.com. And finally, but certainly not least important, Steven Spinell was named a Senior CLASS Award Candidate. Stay tuned for our Weekend Preview before Miami takes on Alaska at 11:00pm Eastern time on Friday and Saturday nights! Miami takes a 4-3 overtime victory behind 3 points each from Czarnik and Barber. Entering the night, Miami was already the only unbeaten CCHA team, as all 10 others have at least one loss. After the night’s play was over, the Providence Friars proved they are going to be a team to watch in Hockey East, but Miami came out with a hard-fought 4-3 overtime victory and remain the CCHA’s only unbeaten team. Freshman Riley Barber had a goal and 2 assists and Austin Czarnik did him one better with 2 goals and an assist, including the game winner, to lead the RedHawks. Czarnik had 5 shots and was a +2 on the night. Throw in 4 blocked shots and he earned the #1 star of the night, without question. Barber has now scored goals in 3 straight games, not to mention 3 assists in the exhibition against Western Ontario. He had one assist on Austin Czarnik’s 2nd period goal – Czarnik’s first of the year – as well as another helper on the overtime winner. He is very quickly becoming a formidable scoring touch on the top line and will be certain to get more and more looks all season. We’ll be looking for Barber in a certain CCHA weekly release around Monday morning. The Friars proved to the Hockey East front runners that they are not to be taken lightly with a shootout loss and overtime loss in hostile Coach Cady Arena. They went down 1-0 after Barber’s goal in the first, and were also down 2-1 and 3-2 in the game. It has to be tough to think you came back 3 times in the game, held a lead on Friday night, and didn’t leave Oxford with even a split, rather just a loss and a tie. Providence Head Coach Nate Leaman agreed: “What hurt us was a slow start,” said Leaman. “We played from behind all night. I’m proud of the guys coming back in the third period to tie the game, but it’s tough to play on the road from behind.” (source: USCHO) Miami now holds a 4-3-1 lead in the all-time series against Providence after this weekend’s highly entertaining series. Providence didn’t have a shot on goal until 12:08 in the first, and they made it count. John Gilmore put the first PC shot in the back of the net on a 3 on 2 rush in the first period, and had 3 shots and 2 blocks on the night. Frehman Jon Gillies looked good in net again tonight, blocking 26 of 30 shots, and was again bailed out by his teammates as he was last night. The Friars recorded 13 blocked shots on the night and many of his saves were of the routine variety. Heading down the closing stretch of the game, Miami looked like they were playing in their shell and doing a great job of applying a little pressure at the right times to try and get an insurance goal. Until, that is, Blake Coleman was called for a 5 minute major penalty. Coleman was called for charging with just 5:52 left in regulation – a call that just about everyone in the building thought was a very clean, shoulder to chest check. It must be his size advantage that the hit was considered dangerous, and Coleman may have left his feet for maximum effect. In any event, the Hawks killed the 5 minutes, but only 4 seconds after the penalty expired, Noel Acciari scored his first collegiate goal for Providence and the game was tied once again. The goal – of the 6 on 5 variety – would send the game to overtime where Miami would tally the game winner on Gillies. On the other end of the ice all night was Miami’s Jay Williams. The firecracker looked good all night and probably could have stopped 2 of the 3 goals if it weren’t for well-timed screens. From my point of view on my computer, he had a great game and looked stellar in recording his second win in as many games. Defenseman Matthew Caito gets on the score sheet for his first point as a RedHawk. Caito made a LASER of a pass about 100 feet up the ice to a streaking Blake Coleman for a goal at 18:59 of the first. Caito is proving to be a more than worthy pair for Captain Steven Spinell, and has been showing some great vision on the blue line. In addition to Barber and Caito’s strong play, another freshman Michael Mooney appeared in his first NCAA game tonight. He was paired with yet another freshman Chris Joyaux on the blue line. Joyaux and Mooney were the third defensive pairing on the night, but each played solid minutes and should grow into a solid pairing, if they continue to play together for up to 4 years. Mooney took Ben Paulides spot on the ice tonight. We’ll look for some information on Ben, but after taking 2 penalties last night, we wonder how that played into tonight’s benching. In this weekend’s matchup, the “Hawks certainly got more than they bargained for, and it turned into a good test as they head to Michigan next weekend. We’ll certainly have more on next week’s matchup later in the week, and keep an eye out for the Sunday #SixPack on our twitter page. Thanks for reading, RedHawks fans, and BEAT MICHIGAN. Miami Box Score and Game Notes. After last year’s up and down season, followed by an unbelievable momentum swing and an unceremonious exit to the NCAA tournament, the RedHawks lost a group of 10 seniors, and endured early departures by leading scorer Reilly Smith and an underachieving, but promising freshman in Tyler Biggs. With a revamped team that includes 11 freshmen and 13 new faces, Miami enters the season this weekend with a home exhibition against Western Ontario. Today, we look ahead to the season with our 2012-13 Preview. First off, you can find the schedule here and we take a quick look at the TV schedule here. As mentioned above, the RedHawks take the ice on Sunday afternoon with an exhibition against Western Ontario. We all know how these usually go, and this should be a great way to start things off for a group of skaters that is extremely young (18 underclassmen! ), but extremely talented. Western Ontario will cross the border to take on Western Michigan on Saturday, and will then head to Oxford on Sunday. I would expect Coach Blasi to test out each of Miami’s new netminders (all 3 are rookies!) in the contest, as Freshmen Jay Williams and Ryan McKay will likely split much of the playing time this season. More info on the situation in net in our upcoming season preview articles. The first 4 weeks of the season will be an interesting set of games, and should test the young ‘Hawks early. After the exhibition game, Miami welcomes both Colgate and Providence to Goggin Ice Arena and then opens CCHA play at Michigan in week 3 – a place where Miami historically has been AWFUL sub par. Follow that up with a trip for an always entertaining series in Big Rapids, MI against Ferris State, and you have a recipe for a .500 start if I’ve ever seen one. Ferris State has 18 returning letter-winners compared to Miami’s 18 underclassmen, and the Bulldogs are coming off of their first ever Frozen Four berth and National Runner-Up finish. Miami finishes out November with home series against Northern Michigan and Michigan State, and then makes the long trek to Alaska. December opens with a home series against Lake Superior State. The ‘Hawks then have a road series in Columbus against Ohio State before Winter Break. Miami’s first “special appearance” comes in between Christmas and New Year’s, as the ‘Hawks travel to the Pittsburgh College Hockey Invitational, hosted by Robert Morris. Miami will take on Ohio State on Friday night – likely to be the premier game of the weekend. Depending on the outcomes, Saturday’s opponent could be Robert Morris or Penn State, who will be playing their first season of Division I Hockey in 2012-13. Yes, if you’re counting, that will mark 3 consecutive games against Ohio State during this stretch in December. Get an early jump on your hatred of the Suckeyes now by taking a look at their awful uniform selections from recent years (scroll down to view pictures). As the new year opens, Miami will head to Northern Michigan, and then has perhaps their toughest road trip of the year to Wisconsin in mid-January. Wisconsin comes in with high expectations on the season, being ranked 18th in the USCHO preseason poll – a ranking that is rather high for the traditional powerhouse. Bowling Green and Alaska come to Oxford, followed by a road trip to Western Michigan before the biggest series of the season for the RedHawks. 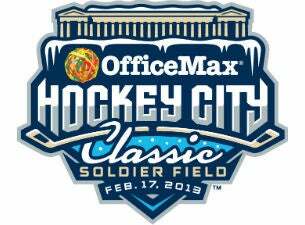 Miami will play Notre Dame on Friday February 15th in the confines of The Goggin, and then the same teams will face off in Chicago’s Soldier Field in the Hockey City Classic on Sunday the 17th. Wisconsin and Minnesota will play in the late game in Chicago. We’ll have full coverage of the event from every angle, including what we hope to be an on-ice picture inside Soldier Field for the Warriors. Tickets are on sale now for the games. Contact the Miami ticket office for seats in the Miami section, or head to Ticketmaster.com for other accommodations. We’ll see you in Chicago! The season ends with a road series at Lake Superior State and a home series against Ohio State before the CCHA tournament commences for the final time. Overall, Miami’s schedule includes just 4 teams who made the tournament last year (Ferris State, Michigan, Michigan State and Western Michigan) and will play 2 games against each of these teams. Preseason voting has taken place, and Miami is 4th in the CCHA Coaches’ Poll and 5th in the CCHA Media Poll swapping places with Ferris State in the two. You can get the scoop on the full CCHA polls here. Michigan took the top spot in the Media poll (must be a bunch of Michigan homers in this voting group), and Notre Dame took the top spot in the Coaches’ Poll (blinded by the golden dome, perhaps?). We are excited to start the season and our expectations are no different any other year. We expect to improve every day and make sure that we’re playing our best hockey at the right time. But more importantly, more so than any other year, we have 12 new faces on our team and so our philosophy of just trying to be the best that we can be each and every day is really important going into the year. We’ve got a really good senior captain in defenseman Steven Spinell that will lead the way, not only on the ice but off the ice as well. I think our schedule is one that is extremely challenging not only in our league from weekend to weekend but non-conference and obviously we’ve got a big game in February at Soldier Field with our league rival, Notre Dame. With so many alums in the Chicago area, both hockey alums and Miami alums, it will be a special event for our university and everybody associated with it. The full audio of Coach Blasi’s 8.5 minutes on the call can be heard here. Coach Blasi certainly has a lot to say about the leadership capabilities of Captain Steven Spinell, and I for one am looking forward to seeing him lead the way for the RedHawks this year. As you may have heard, the 2012 preseason polls are out, and Miami is ranked 9thin each of the official polls. Miami is not listed in the Inside College Hockey “10 for 13” which ranks their top 10 teams for the upcoming season. The USA Today/USA Hockey Magazine Poll and USCHO.com Poll are linked here. Austin Czarnik was named to the preseason All-CCHA 2nd team: . USCHO also thinks highly of “Z” and has him in their 10 forwards to watch for 2012-13. Full All-CCHA Team selections can be found here, with Notre Dame’s TJ Tynan leading the way as the favorite for CCHA Player of the Year. Western Michigan and Michigan lead the way with 3 players each spread among the top 2 teams. We’ll have more for you across this weekend and into next week with team previews as well as a comprehensive preview of the entire Miami squad before next weekend’s season-opening series against Colgate. Only 3 days until the puck drops, and we can’t wait to cover it all for you! Go ‘Hawks! > Future RedHawks Curtis McKenzie, Max Cook, Cody Murphy, Steve Spinell and Reilly Smith have been listed on the NHL Central Scouting “Watch List” for the 2009 NHL Draft. McKenzie and Cook are “B-Rating” players while Murphy, Spinell, and Smith are “C-Rating” players. Just what do these ratings mean you ask? A Rating: A must see player who is predicted to be a potential First or Second Round Draft selection in the upcoming NHL Entry Draft. Third to Fifth Round Draft Selection in the upcoming NHL Entry Draft. selection in the upcoming NHL Entry Draft. > Elite Prospects Hockey has a great article on Steve Spinell, coming to the RedHawks hockey program in 2009. > Steve Spinell, a defenseman slated to join the RedHawks blueline next season who currently plays for the Fargo Force, has been named the CCM USHL Defensive Player of the Week. 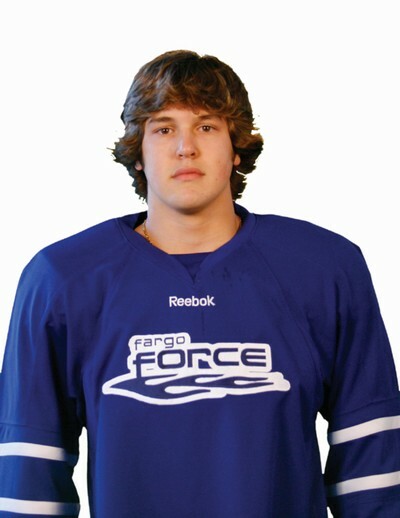 Spinell helped the expansion Fargo Force get off on the right foot in the first weekend. On Friday night, Spinell set up the eventual game-winning goal and then sealed the win with an empty net goal as Fargo beat Omaha 4-2. The next night, Spinell went scoreless in a 3-2 loss to Sioux Falls. He was +2 on the weekend.